"Listening back to the earlier albums, it was like reading a diary. Each time I listen to a track, especially something like 'The Celts' or 'Watermark', I can remember writing the melody, arranging it, what worked and what didn't. That three or four minutes is like a little story for me." She is one of the most enigmatic of performers. She gives few interviews, is intensely private and has never performed her music live. Yet Enya is one of the most successful female performers in the world. The Donegal-born singer-songwriter has a worldwide following the envy of many bigger and brasher music acts. 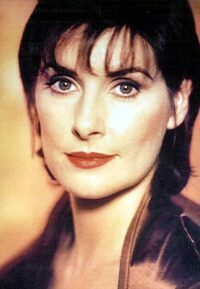 Albums sales have topped an astonishing 33 m and there are no signs of any dip in the public's enthusiasm for Enya even after a solo career which has now lasted for a solid decade. And yet Enya, the individual, remains relatively hidden from the wider public. However, she is coming out of her self-imposed shell more and more these days, particularly to promote her new album, a "Best Of" collection called "Paint The Sky With Stars." She recalls how assembling the contents of the album was a curious experience. "Listening back to the earlier albums, it was like reading a diary. Each time I listen to a track, especially something like 'The Celts' or 'Watermark', I can remember writing the melody, arranging it, what worked and what didn't. That three or four minutes is like a little story for me." And what a story. Born Eithne Ni Bhraonain, she is a member of the Brennan family who make up Clannad, the equally famous traditional band of which she was once a member. Linking up with husband and wife team, Nicky and Roma Ryan, to compose music for the BBC TV series, "The Celts", in the mid-'80s was to change everything. With Enya composing the haunting melodies, Roma writing the lyrics and Nicky acting as producer, they came up with a brand of music which has been variously described as ethereal, new age, Celtic ambient, rich and velvet and melancholic. It was to prove a winning formula with the single "Orinoco Flow" knocking Kylie Minogue off the top of the British charts. The subsequent albums, "Watermark", "Shepherd's Moon" and "The Memory of Trees" sold millions and millions. Her "Celtic ambient" sounds have found willing ears in the oddest of places across the world with the result that putting the name Enya into an Internet search will produce no less than 75 different Web sites, all faithfully devoted to the works of the young lady from Donegal. Worldwide album sales now amount to an astonishing 33 million, making Enya a very wealthy woman. This fortune has recently allowed her to buy a £2.5m castle in the star-studded Killiney showbiz belt in Co Dublin, a place where she intends to put down roots and call home. "As soon as I walked in, I was home", she explains, "I have looked around big houses before and they never did anything for me. For a while now I've actually been looking for a place, I am kind of yearning to have a place to call home." As yet, however, she will be in the six-bedroom Killiney Castle on her own. There is no man in her life but that may change: "That is one of the reasons why it is important to have a little more time to myself. Because of the sacrifices of the world, it has been very difficult on my past relationships." Yet it is the music which is the real passion in Enya's life. She is already thinking about her next album but still has not performed her work live and that is something which continues to exercise her mind, as well as her fans. "I have no problem physically doing it because I did it with Clannad and there are songs on the album where I just performed them. The only thing I worry about is adapting the music to stage, I would not just do it for the sake of doing it, I am a perfectionist and everything would have to be right," Enya says. Whatever way it goes, Enya will retain her loyal and devoted fan base. They can't get enough of the music made by this quiet, delicate Donegal artist who earlier this year picked up her second Grammy award in America and is likely to go on picking up accolades for some time. Note: Transcribed by Tomás Román.